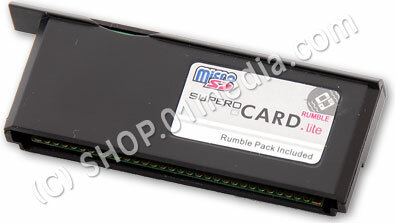 Flash Carts other : Supercard Lite Rumble - Micro SD adapter / flash kit for NDS Lite (without memory), black - SHOP01MEDIA - console accessories and mods, retro, shop - One Stop Shop! Exteme small, designed specialy for Nintendo DS Lite and standard Micro SD memory. Avalible also in white.Exteme small, designed specialy for Nintendo DS Lite and standard Micro SD memory. Avalible also in white.Whats "Rumble"? Play original DS Rumble games on SuperCard Rumble Series, and Rumbling in game like Original Rumble PAK. SuperCard Lite Rumble has the same features as Supercard Lite, but no GBA support. It works with DS games only. Designed special for Nintendo DS Lite, fits perfectly into NDS Lite without sticking out (same size as G6 Lite and EZF 4 Lite). Works with standard Micro SD memory modules. Memory can be removed without removing SuperCard Lite from NDS Lite. Fits perectly NDS Lite, not sticking out at all. Special RUMBLE system - ALL GAMES can be programmed to RUMBLE! 100% DS games compatibility with perfect save function (no GBA support). New Power Save design, extend playing time. High speed R/W system, support high speed flash memory card, without any slow down. Supports save to flash memory card directly, never loose your save. Compact MENU system, multigames support. 100% compatible with MoonShell - extends your DS to a multimedia system. NOTE: To be able to boot commercial NDS game backups you need to use SuperKey! (it works fine also with PassCard 3, EZ Pass3, Neo MK Mini and other passme 1/2/3 compatible devices). If you dont want to use any passme devices you may reflash your NDSL bios (using FlashMe).